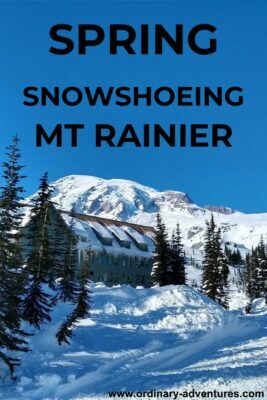 Why Spring Snowshoeing at Mt Rainier? If you’re done with snow and ready to pack the snowshoes into the back of the closet, I totally get it! 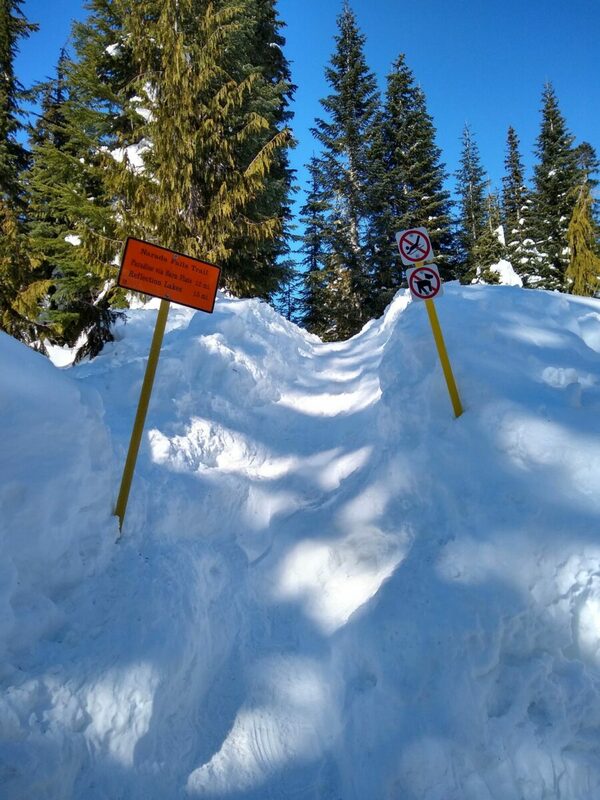 But let me try to convince you not to put them away just yet…the glorious spring snowshoeing season is here and once you’ve tried spring snowshoeing at Mt Rainier, you might find that snowshoeing in a t-shirt is for you! Honestly it’s the absolute best! Spring has deep snow here, but the days are longer and there’s more sun! If you’re looking for a middle of winter outing, check out my previous posts on that here, here and here. If you’re visiting the late spring (late May and June) and want to avoid snow, or if it’s a rainy day, try one of these ideas! When is spring at Mt Rainier? Important question! Many folks arrive in May and expect it to be summer but it is definitely not! Mt Rainier gets a ridiculous amount of snow and generally the area around Paradise is not snow free until sometime in July! In April and May there is still many feet of snow and plenty for snowshoeing (in normal snow years). I have snowshoed there often in June (the novelty!) but it is a little less predictable. It’s important to check the avalanche forecast as well as to check in with the rangers about avalanche safety as avalanche risk can become higher in the spring on warm afternoons. 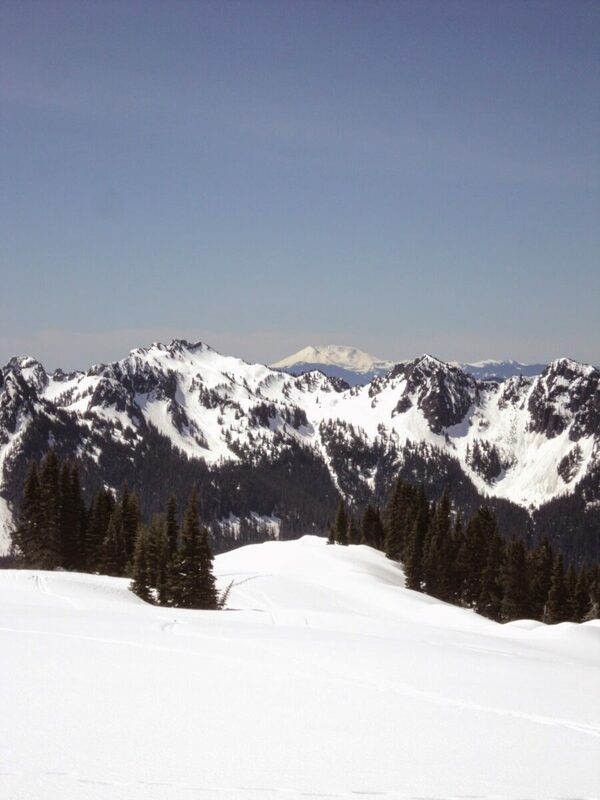 Spring is a lot like winter at Mt Rainier (in the high country at least) but with more sun and longer days! Roads into the other parts of the park generally start to open in late May, so by June you could choose snow or you could choose waterfalls on the east side of the park. For the purposes of this post, we’ll say that spring in Mt Rainier is late March through late May, whenever other roads start opening. Where should I go for spring snowshoeing in Mt Rainier? The area around Paradise is fantastic for snowshoeing in the spring. Like all snowshoeing, make sure to check the weather and the avalanche forecast before venturing out. There are two specific areas that I would highly recommend. This map includes them both, you can print and bring it with you. The map is awesome because it includes winter specific trails and also shows you where to watch out for avalanches. You’ll notice that both these suggestions are relatively short. I find that snowshoeing is much harder and slower than hiking, so I’d suggest planning for a shorter distance that you would normally hike. Both of the hikes described below can be added to and made much more challenging if that’s what you want (see map for options like Panorama Point or going from Narada Falls up to Paradise with a car shuttle, or round trip). For this snowshoe outing, start at the Narada Falls parking area (there are year round restrooms here). You can venture a look at the falls if you like (you might catch them frozen or rushing with snowmelt) by going to the right past the restrooms and it’s a very short distance to see them. Be extremely careful not to get close to the edge as snow builds up over the edge of the rocks which is extremely unstable. Then, head back up to the restrooms where you’ll find a winter only trail in the snow that goes directly behind the restrooms marked with a small orange sign. The first 10 feet of the trail makes it look impossible, but it’s not that steep once you get up the snow berm! The trail climbs up the hillside and in less than half a mile crosses a road (road in summer, but closed in winter). Here, turn right for reflection lakes. Right away you’ll come to another junction where you can either continue on the road (right) or a trail (left). Both ways take you to Reflection Lakes in just under a mile, however the road crosses an avalanche prone area, so in times of avalanche danger go left. If you stay right, the road will take you directly to Reflection Lakes on the left. If you go left, you’ll be on a trail and there will be a couple more junctions and you’ll go right each time (this is marked on the map). The lakes will be frozen but don’t venture out on the ice as its not very stable (especially in spring). With the frozen lake, you won’t see the reflection but it is still an incredibly beautiful place and a wonderful place to eat your lunch! When you’re ready, return the way you came. This route is for those who like big views! Not only are you on the side of Mt Rainier, with the volcano right in your face, but as you climb higher, surrounding peaks such as Mt St Helens and Mt Adams come into view, not to mention the many other mountains surrounding you! For this one you’ll basically head straight up from the Visitor Center, following orange signs and the footsteps of others. You can spread out and wander in this area (being mindful of avalanche slopes) as much and as high as you like! Just stop for your lunch and soak it in whenever you’re done climbing. What Should I wear and bring for Spring Snowshoeing at Mt Rainier? Most especially bring sunscreen and lipbalm. You can get burned really fast on the snow (even when it’s cloudy). Sunglasses! Normal hiking clothes will be good, but make sure to have your extra layers since you’re likely to get hot snowshoeing but could get cold when taking breaks. Bring something waterproof (even a garbage bag) to sit on so you don’t get super wet! Make sure to have waterproof shoes or your feet will be very wet.